Do you want to drill your walls and fear you will hit a wire or pipe behind the wall? Stop worrying, now there is a device ‘Walabot’ connecting your SmartPhone and this gets you a clean x-ray of the walls that you can see the studs, pipes, cords and also rodents. 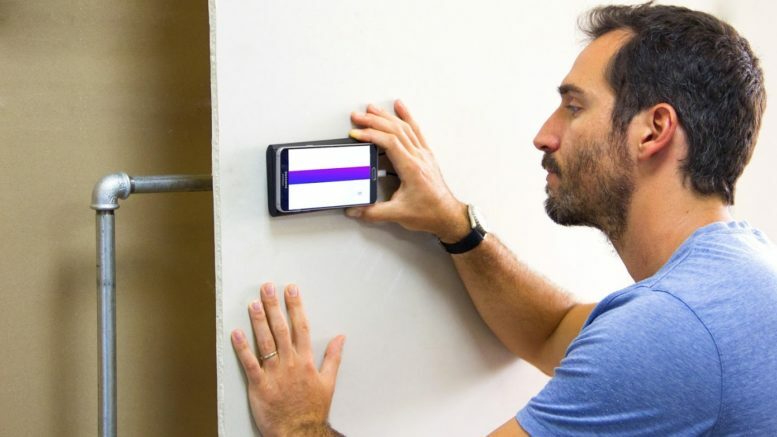 An Israel company developed a 3D-imaging new sensor that allows you ‘see’ inside the walls using Smartphone. You get to see the structural foundations, metal pipes, plastic, studs and electrical wires. This device ‘Walabot’ suddenly has turned a smartphone into a 3D imaging system and you can use it at your fingertips. The device looks into drywall, cement and informs you the depth and also identifies movements behind walls. The advanced technology allows seeing things hidden around them, thereby adding another dimension to use smart devices,” they said. Walabot gives inventors and makers an opportunity to use the 3D imaging sensor technology and develop content. They can use the apps existing or create individual apps. “Walabot’s technology is spontaneous and simple, so people need no special expertise. In fact, with any experience level, one can make use of this app and know the enveloping world better, said the company. “Walabot makes approachable sophisticated imaging technology that is equally affordable and usable to all,” said Raviv Melamed, the founder and CEO of an Israel based company, a 3D-imaging sensor company, Vayyar Imaging. It is perfect for your DIY job. This was actually developed to see human tissue and to detect cancer types. Now, Walabot will help in detecting even the pipes and wires location in the walls, thus you can avoid that spot. Forget the wall, now Walabot will also detect your furry friends such as a cat that got behind the walls looking for mice. This device helps in detecting behind the walls termite nests and wasp. It can see across concrete that is thick up to 4 inches. The Walabot connect at the Smartphone back that you can drag the phone on the wall to know that is behind and view it live. The wall sensor works with Android Smartphones except the Samsung Note 7, LG V10 and LG G4, nor with iPhones. Be the first to comment on "A new dimension allows your smart devices see hidden things"